There are two responses I usually get when I tell someone I am a myofascial release therapist. The first one is: What is that? The second is, You mean foam rolling? I perform myofascial release (or MFR) as taught by John F Barnes. If you decide to give MFR a try, I highly recommend you use a therapist trained by him. So what is MFR? MFR is a buzzword often used to describe deep tissue massage techniques. MFR is not a deep tissue technique. It is a whole body approach where a long gentle hold that engages the fascial system, and waits, for this system to release itself. By using this approach, the body is able to heal itself. To really understand what fascia is, I highly recommend watching this video on YouTube. It is called Strolling under the Skin. I learn something new from it every time I watch it. In the video, you can see that fascia, which experts used to think was just the outer layer of the muscles, is actually a web throughout your body. This web connects every single cell of your body and even goes through your cells creating the cytoskeleton. On this website, you can see an image of a heart. This image is called a ghost heart. This is a heart that had all of its cells removed so that only the fascia remains. As you can see, the fascia is what gives the heart (and every other organ in your body) its shape and its ability to move. So what is fascia? To provide a simpler explanation, fascia is composed of three components: elastin, collagen, and a gel-like ground substance. The elastin gives the fascia its flexibility. The collagen gives it its stability. The ground substance provides a modem for nutrients, electrical impulses, light waves, and sound waves to travel. If you watched the video above. You saw the tubules that form the fascial system; you also saw the liquid “ground substance” or “morning dew.” The collagen and elastin form the tubules and the ground substance is the liquid. Whenever you experience trauma, either physical or emotional, or perform repetitive motions with improper form, you affect the fascia. They can cause the fibers to become restricted and the ground substance will become solidified. This prevents nutrients and nerve impulses, among other things, from reaching your cells. It can also put as much as 2000 pounds of pressure per square inch on your cells. You may feel the pain from these restrictions immediately, or it may take years of small restrictions before you feel the pain. Here is an image of “fascia man.” As you can see, when one area gets tight, it doesn’t just affect that spot, but ends up affecting several areas throughout the body. This is why traditional approaches to pain can be so ineffective. Fascia man looks like he’s got tightness throughout his body, but he may not feel pain throughout his body. He may be coming in with neck pain, or head aches. Can you see how just focusing on the neck wouldn’t help him? His hips would pull him right back into neck pain. Why should I choose myofascial release? Myofascial release is the ONLY manual therapy that can change the collagen fibers of the body. Traditional massage, mobilizations, and manipulations only address the elastin. When you apply a long gentle hold, the first 90-120 seconds releases the elastin. After that, there is tension, or a hold. You have to wait an extra three to five minutes to release the collagen. This is where the magic of myofascial release comes occurs. By waiting those extra few minutes (or even longer), you can create a permanent effect on the body. In other modalities, the elastin is released, but the collagen will pull the elastin right back to where it was . . . and the pain returns. Another important factor is the touch that is applied. When a John F Barnes MFR therapist applies pressure on the fascial system, they push until they feel resistance. Then, they stop and wait. THIS IS ESSENTIAL! If they push too hard, they will be doing traditional bodywork and trying to “break up” fascial tissue by breaking it. If you push too light, you don’t engage the fascia. One other important thing that occurs when the collagen releases, is the ground substance that became solidified can become fluid again. This can often be felt by either the therapist or the patient as a pulsing. There can also be a sense of “energy” moving through the body when this occurs or the feeling of butter melting. Because of fascia man above, or as this picture shows: the sweater. You may feel a release somewhere other than the spot where the therapist if working. DON”T WORRY. THIS IS COMPLETELY NORMAL. It’s actually a good thing. Inform your therapist when you feel this so that she or he will know where to work next. 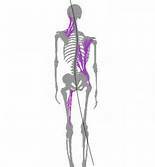 For more information on JFB myofascial release, you can visit myofascialrelease.com. Click here for images and videos of the fascia. Images “fascia man” and “sweater” used with permission from MFR Seminars.